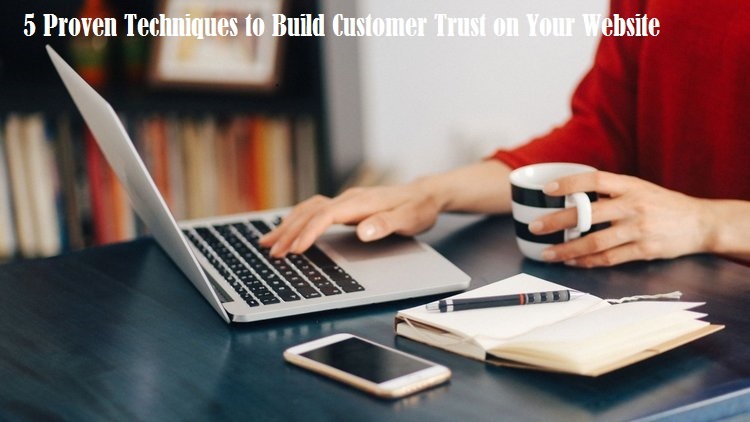 An integral factor in business growth is the ability to build customer trust. Talent goes a long way to move your business forward. But at the end of the day, a trustworthy relationship with your client base is one of the simplest, yet most important foundations of a successful business. Trust ensures that you’ll have lifelong customers. It takes a lot of time, commitment, and effort to build this level of trust, but with these five proven techniques, it doesn’t have to be an uphill battle. Your website design is one of the biggest influences on a customer’s initial impression of your business. Various case studies have shown that an updated design can increase your conversion rates by 33% and upwards – a figure that you cannot afford to ignore.A well-designed, updated website either follows modern trends or at the very least makes use of a classic design without appearing out-dated. To accomplish this, consider your website’s readability. White space is a major factor in determining readability. Cluttering your site’s visuals not only makes your web pages harder to read, but also makes it harder for visitors to trust you.When your site has too many ads, including pop-ups, visitors’ perceptions of trustworthiness is negatively affected. Instead, promote readability in your design. Ensure that your page elements behave intuitively. Visitors should have a sense of familiarity with your layout and the functions of page elements.Consult UX experts and conduct usability tests to ensure that your site is well-optimized in this regard if necessary. Finally, you should also recall that Google has been telling us for years that the majority of web users are accessing sites from their mobile devices rather than their computers. To promote customer trust, use a mobile-friendly design. Thought leadership – instead of merely spamming clients with opportunities to benefit from your product or service, social media also gives you the chance to showcase your industry expertise. Authoritative sites are respected and trusted. Transparency – according to a survey by BRANDfog, 78% of consumers say that a company’s social media activity leads to better communication. 64% also agreed that it improves transparency, fundamental in building trust. Speedy communication – social media is a powerful tool for communicating with your customers and remaining aware of their perception of your business or brand. Accountability – by openly engaging with your clientele on social media, your business’ accountability is established. Social media can be brutal in slamming down on companies who fail to respect customer trust in any way. Make it easier for your clients to communicate with your business not only by developing a social media presence but by integrating social sharing on your website. This builds an awareness of your social media presence, automatically assisting with the four points above. Getting scammed online is a common experience, unfortunately. For this reason, research has shown that at least 84% of online shoppers will abandon a purchase if the site is not properly secured. Furthermore, most users say that they trust a website more when they have an SSL certificate installed. SSL is so important in developing customer trust that Google has started giving preference to sites with SSL certificate installed when generating search engine results pages. HTTPS sites now dominate the first pages in SERPs. Beginning January 2017, Google has also begun to display a “not secure” warning on websites that do not have an SSL certificate installed in their Chrome browser. As of October 2017, it is an official requirement for all websites to make use of SSL if you don’t want Google to penalize you. This is because a secure site promotes customer trust. A secure site encrypts private information and assures users that the information is being sent to the right people. Google is promoting a safer, more trustworthy web. When you install an SSL certificate, you’re instilling trust by assuring your clients that their personal information – including banking and basic biographical details – are safe from exploitation by hackers. Promoting customer trust with regards to their personal information doesn’t stop at installing an SSL certificate. For consumers, this is a very important issue – which means it’s equally important for your business. Users are highly unlikely to continue making use of a retailer or service provider if even one breach of data security occurs. Also See: HOW ARTIFICIAL INTELLIGENCE IS ENHANCING DIGITAL MARKETING? Visa, Mastercard, PayPal, and Norton are some the most recognized site seals and can easily show a positive effect on your customer trust levels, as well as your online sales figures. Incorporate as many security badges as possible without cluttering your web page of course. Vlad Khorkhorov is a coder and entrepreneur with multiple successful products and services behind his back. When not working, he enjoys beach volleyball or skiing down the cold Canadian mountain slopes. these tricks are really good one. thanks for your posts. authority and also our presence in the online world. that we are real person and they can build trust issues over us. No problem, glad you liked it! Nice to read this article ,keep posting so that the user can gather so many techniques to reach their target .